In case you thought The Walking Dead couldn't get more harrowing, the zombie phenomenon is headed to a more in-your-face platform: virtual reality. Skybound Entertainment, the company helmed by The Walking Dead creator Robert Kirkman, announced a partnership deal with Skydance Interactive during E3 2017 to create original VR games set in Kirkman's grisly, zombie-infested world. 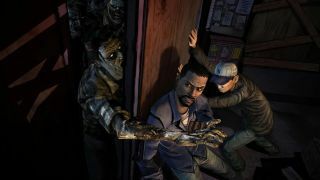 The partnership is expected to work over multiple years to produce "a number" of The Walking Dead VR titles, but few other details were given for its first project other than it will feature a brand-new setting and cast of characters. While Skydance and Skybound also promise "an innovative contextual interaction system" for their upcoming zombie VR game, that phrase has so many gaming-industry buzzwords we can only speculate what it actually means until more concrete details emerge.